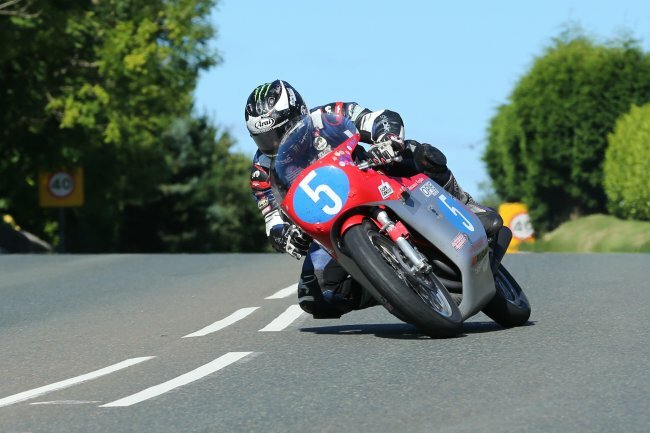 Michael Dunlop won a thrilling Okells Junior Race in today’s Isle of Man Classic TT Races presented by Bennetts, the opening race of the day. The debate on the start line was focused on the impact of refuelling but ultimately it didn’t prove decisive with Dunlop, who pitted at the end of the second lap prevailing over Rutter, who didn’t. The Northern Ireland rider clawed back a deficit of over thirty seconds to take the chequered flag in a new race record for the class of 103.061 (1:27.51.735) for the class, beating Chris Palmers time set in 2013 by over a minute. Ex-GP World Champion Freddie Spencer got the race underway on time at 10.15 with Clerk of the Course Gary Thompson advising that conditions were excellent with good visibility all round the course apart from damp patches at Glen Helen, Ginger Hall and Ramsey Hairpin. Dunlop, who topped the qualifying board on the Black Eagle Racing MV Agusta with 102.567, undoubtedly started favourite but Jamie Coward on the Ted Woof Honda Craven K4, brother William riding a Davies Motorsport Honda, Classic Racing specialist Alan Oversby on the Davies Motorsport Honda and last year’s race winner Michael Rutter on the ’72 Ripley Land Racing K4 Drixon Honda all posted 100+mph laps in qualifying. As expected Michael Dunlop lead at the opening checkpoint by seven seconds from Rutter but there was disappointment for brother William who retired at Ballacraine on the opening lap. 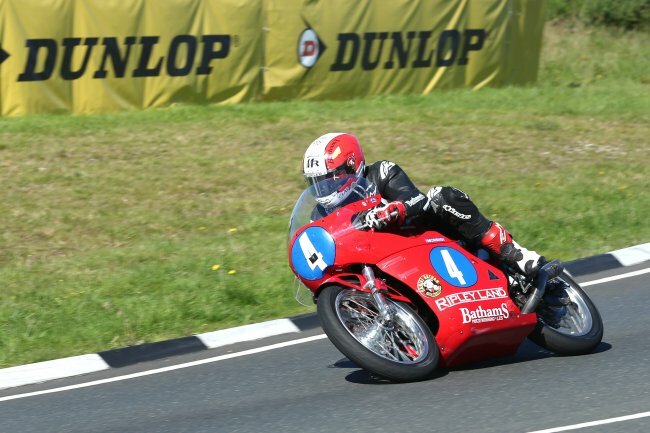 Coward held third place by 2 seconds from Oversby with James Cowton riding a ’62 Honda completing the top five and Cameron Donald, riding the Ripley Land Racing AJS was back in sixth almost ten seconds behind Coward. Dunlop moved ahead of Rutter to lead on the road by Ramsey by over ten seconds but behind the leading pair Donald moved into the top five when Cowton retired on the run into Kirk Michael on the opening lap. Dunlop maintained his ten second lead with his opening lap of 103.775/ 21:48.864 from Rutter (102.913/ 21:59.836) who in turn had a lead of over 27 seconds from third placed Jamie Coward (100.818/ 22:27.253). Oversby (100.458/ 22:38.31) and Donald (97.794/ 23:08.923) completed the top five with veteran campaigner Dave Madsen Mygdal on the Team Gimbert Racing Honda holding sixth a further 9 seconds back on the fifth placed rider. While Dunlop was powering ahead at the front of the field on the second lap, his Black Eagle Racing teammate Dean Harrison was reported to have clutch problems and the Bradford rider duly retired in the pits at the end of the opening lap. Rutter edged back in front of Dunlop on the road at Cronk-ny-Mona, reducing the deficit to under ten seconds in the process, and with Dunlop coming into the pits at the end of the second lap and Rutter running straight through, Rutter’s lead was over 35 seconds at Glen Helen on the third lap. Coward (102.087), Oversby (101.728) and Donald (100.209) also ran straight through at the end of the second lap with the deficit between Coward and Dunlop reduced by Dunlop’s pit stop. Oversby maintained his fourth place, ten seconds off the final place with Donald over a minute behind Oversby completing the top five. However, Dunlop was clearly on a charge on the third lap and Rutter’s lead was down to 23 seconds by Ramsey. Coward was reported as a retirement at Kerrowmoar, which saw Oversby slot into the final podium position, Donald up to fourth and Dan Cooper move into the top five. Rutter lead was only fourteen seconds going into the last lap and was down to four seconds by Glen Helen. The Northern Ireland racer duly moved into a two second lead by Ballaugh Bridge, moved in front of Rutter on the road and took the chequered flag by 10.053 seconds from Rutter. Alan Oversby’s last lap of 101.116/ 22:23.294/ clinched third place in an overall time of 101.340/ 1:29.21.268 with Cameron Donald fourth in 98.844/ 1:31.36.622 and Dan Cooper (98.012/ 1:32.23.348) completing the top five. Alex Sinclair on the SCS Racing Drixon Honda took the prize for leading privateer finishing 7th overall in 97.531/ 1:32.50.684. Maria Costello followed up her third place in the Bennetts Senior by winning the Phil Read Classic TT Trophy as the first 250cc to finish. 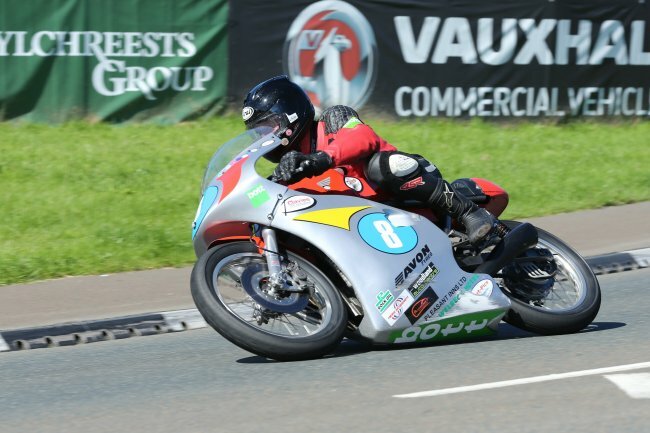 Cameron Donald on the Ripley Land Racing AJS, took the Peter Williams Trophy fashioned using a genuine titanium con rod from the original Wagon Wheels Matchless Arter. The trophy was awarded to the highest placed AJS or Matchess in the Senior and Junior, with Cameron’s 4th place beating Hefyn Owen’s 11th from Saturday’s Bennetts Senior Classic TT Race. Third place went to Alan Oversby in Monday's Okells Junior Classic TT Race. He was riding a Davies Motorsport Honda.